With the horse crisis refusing to abate – where there are simply too many horses being bred and not enough homes for them to go to – increasing pressure continues to be exerted on the spaces available at Redwings. But despite working at capacity, we have remained determined to help those horses and donkeys in most need and partnered with other welfare organisations throughout the year to ensure as many as possible were brought to safety. This year, we have worked alongside organisations - including the RSPCA, Bransby Horses, World Horse Welfare, HorseWorld, the Blue Cross and local authorities - to undertake eight rescue operations involving more than 120 equines. The latest operation, which took place in November 2017, involved six organisations working together to round-up 19 fly-grazed Shire horses near Kidderminster, Worcestershire, with six being offered safe forever homes at Redwings. Our welfare team has also continued to investigate welfare issues reported by the public, with officers attending 207 suspected cases of concern. Meanwhile, our vets and welfare officers attended Wickham Horse Fair and Appleby Horse Fair sharing care advice with owners and providing treatment where needed. The specialist work of our veterinary, rehabilitation and daily care teams has also been in the spotlight this year and will continue to be a focus in 2018. Last year, we took in over 40 emaciated and sick semi-feral ponies from bleak conditions on the UK’s moors and commons – a third of our total intake in 2016. This year has seen our teams focus on nursing these once poorly and petrified ponies (like Arthur pictured below) back to full health, seen them begin basic handling training and even help them safely give birth to five adorable foals. Sanctuary care is also at the heart of our latest ‘Give a Horse a Hug’ winter appeal. 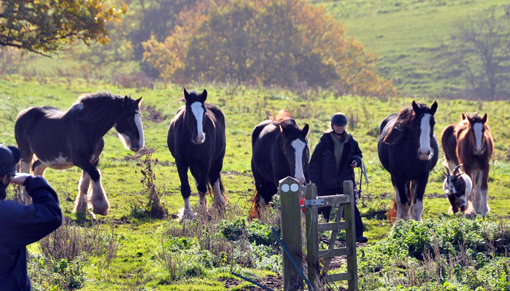 Because every horse or donkey brought into the Sanctuary is offered a home with us for life, our resident population consists of a high proportion of elderly horses, including 204 “veterans” (aged 15 to 19) and 338 “geriatrics” (aged 20 and over). The winter now sees our care teams turn their focus on providing extra care for these older and frailer residents with supporters being urged to give them a helping hoof throughout the colder months – click here to find out how you can help. 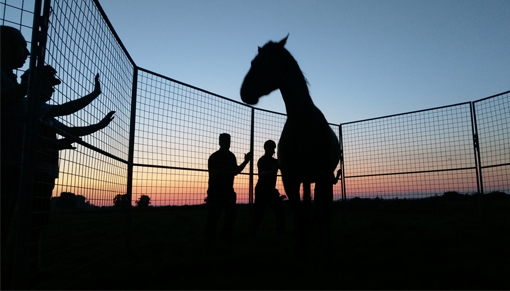 Lynn Cutress, Redwings’ Chief Executive, said: “Despite the ongoing pressures exerted on us by the horse crisis, our rescue work continues to be an integral part of our role as a charity. By working more closely with other welfare organisations and sharing our expertise, together we’ve been able to ensure that those horses and donkeys in desperate need are brought to places of safety. “Our specialist sanctuary care has always been at the beating heart of what we do and this year was no different. Horses and donkeys come into the Sanctuary from a huge variety of situations, and with over 30 years’ experience of rescuing equines, you can imagine the incredibly diverse health and behavioural needs, as well as ages, of our residents that our care teams support every day. Sanctuary care will continue to be a focus next year as Redwings marks the 10 year anniversary of the Amersham rescue which saw over 100 horses, ponies and donkeys saved from horrific conditions at Spindle Farm. Redwings was instrumental in the rescue taking in 60 of these stricken equines - plus six foals born at the Sanctuary - and returning them back to health. A decade on, an incredible 58 are still enjoying happy and healthy lives at the Sanctuary or with loving Guardian families.